Born near Blunclody on 21 July 1894, son of David A. Rose and Mary Louise Lumsden, he attended Bluncody School then farmed near Carroll until his retirement in 1960. He won a number of awards for his Belgian horses and cattle herds. He was active in local church work, the school board, and minor sport. 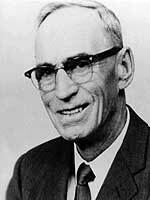 He served for 20 years as Reeve of the Rural Municipality of Whitewater (1946-1967) and was President of the Union of Manitoba Municipalities (1962-1963) and President of the Manitoba Good Roads Association (1966-1967). He was Chairman of the Hog Marketing Commission and a Director of the Children’s Aid Society. On 20 January 1920, he married Mary Cummings Gordon (?-1961) in the RM of Strathcona. They had four children: Allan Rose, Shirley Rose, Marguerite Rose, and David Robert Rose. In recognition of his service, he was inducted into the Manitoba Order of the Buffalo Hunt (1960) and he received a Manitoba Golden Boy Award (1967). He was made an honorary citizen of Brandon, St. Boniface, and Winnipeg. He died at Souris on 18 November 1979 and was buried in Brandon Cemetery. Obituary, Brandon Sun, 24 November 1979, page 16. Obituary [David Robert Rose], Brandon Sun, 5 February 2000, page 17.